You are here: Home / giveaway / Dora the explorer Christmas Carol DVD Review and #giveaway and furniture? 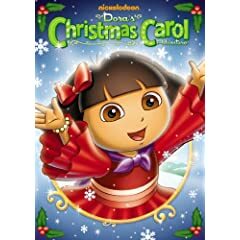 Dora the explorer Christmas Carol DVD Review and #giveaway and furniture? The Dora Christmas Carol DVD comes out soon or is out or I have no idea except that we are watching it today. Ok, so you can purchase it at Amazon. We’ve been listening to Dora’s Christmas CD for a few weeks now and my son has all the songs memorized and now that we have watched the DVD the CD makes sense. All the songs on the CD are from the DVD. It’s crazy but I’m singing the songs all day long now too. Good Grief I just can’t get away from her. The DVD is very cute and is teaching kids not to swipe. It seems that Swiper has made the naughty list this year and if Dora can’t teach him to stop swiping then he’ll never be good again. So Dora and Swiper travel through time learning to be good for Christmas. My husband and I were actually talking about all the different cartoons that are out there and what we watched and how the cartoon re-makes aren’t as good as the new cartoons like Dora. You know, she is teaching good lessons and helping the world while care bears and my little ponies don’t do that anymore. They are all about themselves, yes they still have moral lessons but it’s not past them. I’m not sure if that makes sense. My other News is that Lazy Boy and Nickelodeon have teamed up to make furniture for kids staring Dora and Diego. Lea Furniture is putting out Nickelodeon MyRoom. This new collection was developed in cooperation with Nickelodeon/Viacom Consumer Products and will feature characters from shows including Dora the Explorer, Go, Diego, Go!, SpongeBob SquarePants, as well featuring graphics based on the network’s signature Slime. my two year old son loves dora!!!! He is constantly asking me to turn her on! My 4 year old daughter Steffie is a Dora fan… and her room is decorated in Dora… that bed would look really cute in there! I follow your blog… does that count as subscribing? My little girl loves Dora and my 8 year old son still likes Dora. Dora fan is my granddaughter Haille. I follow you via Twitter — and my ID is GradSchoolMommy. Both my daughter AND son are Dora fans! Just about every spanish word they know they learned from watching her show! Go Dora! My youngest daughter is a huge Dora fan. My daughter Gracie is a huge Dora Fan. Me too! Thanks for the giveaway! My nieces are big Dora fans. Thanks for the chance. My three-year-old son loves Dora! The Dora fan is my daughter! My 3yo daughter loves her! My dd is a huge fan! I wanna win this soooooooooooo bad. My kids really need new beds and this would be such a blessing. Please pick me. my 3 yr old cousin loves dora! My 2 yr old is the big Dora fan in this house. My daughter is a huge Dora fan. My granddaughter loves Dora the Explorer, thanks. My two nieces are. One is seven and one is three. The oldest things she is too big for Dora, but still is a fan. My granddaughter loves Dora. Thank you! I would like to add this DVD to our collection. Alison is the Dora fan in the house. My niece is a huge Dora fan! Teagan is the Dora fan and Kaitlyn is the Boots fan. So win, win if we win. I follow you on Twitter, LandofBears. I voted for you #347 – #1. I voted for you #347 – #2. I voted for you #347 – #3. I voted for you #347 – #4. I voted for you #347 – #5. Dora is my 3-year-old granddaughter’s hero. She screams in delight when the program comes on. At the mall together, she can find every image of Dora whether it is on a backpack or a poster in the jplace. She would love this DVD. My almost 3-year old daughter is slightly obsessed with Dora, to say the least! My daughter is a dora fan. Thanks for the chance. My daughter is the Dora fan! Both of my sons are huge Dora fans! My 2 year old son is a big fan. This is the first cartoon that has caught his interest and the only one he will watch. He comes in the living room and points at the tv and says Duha, Duha. Which is what he calls Dora. Too cute! Both of my sons are Dora fans! my son is the dors fan..he also loves max and ruby, diego and the wonder pets…big time! My niece is a big fan, and I know she’d enjoy this dvd. Thanks! Me, my husband, our ten-year old daughter, and our toddler all love Dora! My 17 month old is the Dora fan. My own children used to love Dora, but have outgrown her. My niece is the Dora fan now! My youngest daughter is the big Dora fan in our house. 1- Used the Share option for StumbleUpon. 2- Used the Share option for StumbleUpon. 1- Used the Share option for Facebook. 2- Used the Share option for Facebook. 1- Used the Share option for Myspace. 2- Used the Share option for Myspace. 1- Used the Share option for Google Bookmarks. 2- Used the Share option for Google Bookmarks. The dora fan is my two year old daughter. My 3 year old daughter is a huge Dora fan. I have 3 nieces that are huge fans of Dora the Explorer. the dora fan in my house is my niece and daughter. My two youngest daughters (4 & 5) are huge Dora the Explorer fans. My son is a Dora and a Diego fan. My grandson Jadon LOVES Dora. Thanks for the wonderful giveaway. The Dora fan in our house is my 3-year old daughter! My youngest daughter is the Dora fan! Thank you! my 2 yr old son enjoys the show! My 2 year old son loves Dora.Thanks! My daughter loves Dora, thanks for the chance! my niece is the dora fan! The youngest girl I babysit loves DOra. My niece is a huge Dora fan. my two year old son loves dora!! My youngest dd is the Dora fan!